As far as I'm concerned, everyone should take themselves on a drive up Route 1, play 101.7 so loudly it drowns out Google Maps, steer with one arm, and dance with the other. Lana Del Rey kept playing today. I didn't mind. On an Indian summer kind of day, driving somewhere I'd never gone before, it seemed right. You know, DJs used to play Will Smith's Summertime when the weather got warm. Now they play Summertime Sadness. One summer ago, I spent a lot of time on Route 1, going up to Revere Beach or the North Shore. For me, it's impossible to be on that road and not think of summer. With the sun streaming through the car windows and a smoothie to look forward to, I could still pretend that it was summer today. 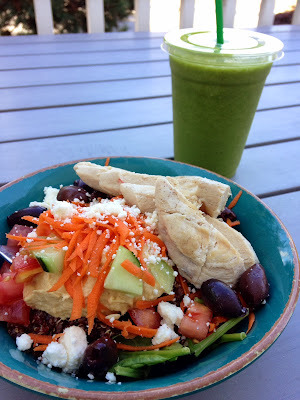 At Sol Bean in Middleton, I got a Tropical Colada smoothie (coconut water, pineapple, spinach, mango, and coconut butter), plus an Athena quinoa bowl with chicken. The smoothie was so good. It was green and refreshing and it tasted like straight up pineapple. Best parts of the quinoa bowl? A seriously ample portion of hummus (totally beat the chicken for flavor) plus warm quinoa. The menu is huge and I would happily try another smoothie (maybe the Purple Rain next time). I sat outside on the porch. Yeah, the porch overlooks Route 114. But at least it's a pretty part of 114 (green leaves, green hills, and cows) and I was happy to be outside. When it was time to leave, I got in my car and turned the volume to low. I had to pay attention to get back to Route 1 and I got confused. But as soon as I was back on Route 1, it was a straight shot to Boston. So the music came back on.